The boys over at Auto Express have reported that the next-gen Ford Focus RS could pump out as much as 330 from an all new turbo charged 2.3L 4 pot power plant. That’s and increase of 29BHP over the current RS model (301BHP) although it’s still trailing behind the vinyl wrapped RS500 which rocks a mighty 345 horsepower through its front wheels. Ford’s engineers have expressed concern over pushing much more power out of the current 2.0L unit and have gone in favor of some more displacement to help whip some more horses into shape. Auto Express also suggest that the new RS will be mated to a new mechanical limited slip differential (LSD) to help channel all that power to the road without it torque steering into the nearest tree. This report goes against recent industry news while claimed that that Ford would be canning Focus RS development in favor of the new high performance Fiesta which will share the RS name. 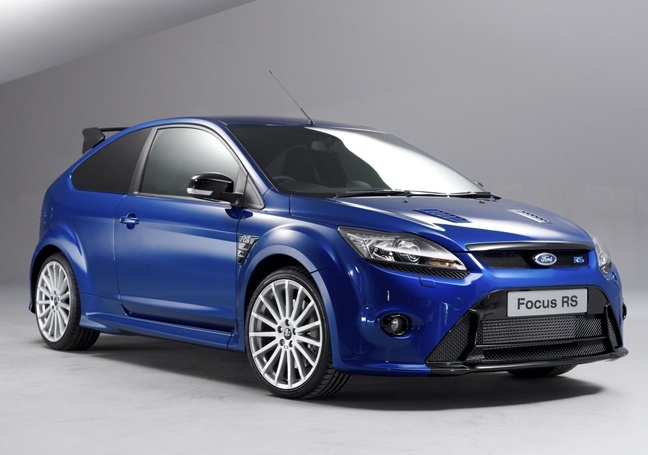 Sources within the Ford’s Special Vehicles Team apparently announced that the Ford Focus RS has been “put on hold” while they go back drawing board to develop the Fiesta RS, a future rival to the Corsa VXR, DS3 and Clio RS. ‹ Topgear Infographic: The test track data archive!